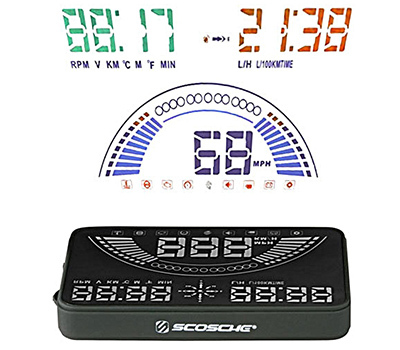 Keep your eyes on the traffic with this Scosche GPS combo heads-up display. Designed to sit directly in front of the driver, this unit lets you view directions and other information without distracting you from the road. Toggle easily between your vehicle’s on-board display and your map using the integrated switch on this Scosche GPS combo heads-up display. PLUG AND PLAY: Power using the vehicles OBD-II interface with the included cable or in vehicles without an OBD-II connector with the included 12V power socket adapter. COMPATIBILITY: Works with most vehicles 2001-Up with an OBD-II interface* or non-OBDII vehicles using the included 12V power socket/cigarette lighter adapter.